Just below in the periodic table, there are some elements usually considered as laboratory curiosities. However in this new century, the elements of the first row, the lanthanide group (which encompasses from lanthanum (atomic number= 57) to lutetium (71)), joint with two transition elements (yttrium (39) and scandium (21)) form the Rare Earth Elements (REE) which begin to have a prominent role in our daily lives. If you put your hand into your pocket maybe you can find your smartphone, if not, it is possible that you are reading this article on it, or you are an old-fashion person that still survive without handing the new technologies. In any case, to have an idea of how these REE are part of our lives you should know that until 12 (of the 17) can be found in a smartphone such as europium (Eu) and yttrium (Y) in the screen, praseodymium (Pr) and gadolinium (Gd) in the speakers, or neodymium (Nd) and terbium (Tb) in the electrical components. If you are one of those few without mobile, don´t worry because they are also present in computers, TVs, cameras, vehicles, CDs and a wide etc mainly as part of high-tech applications. 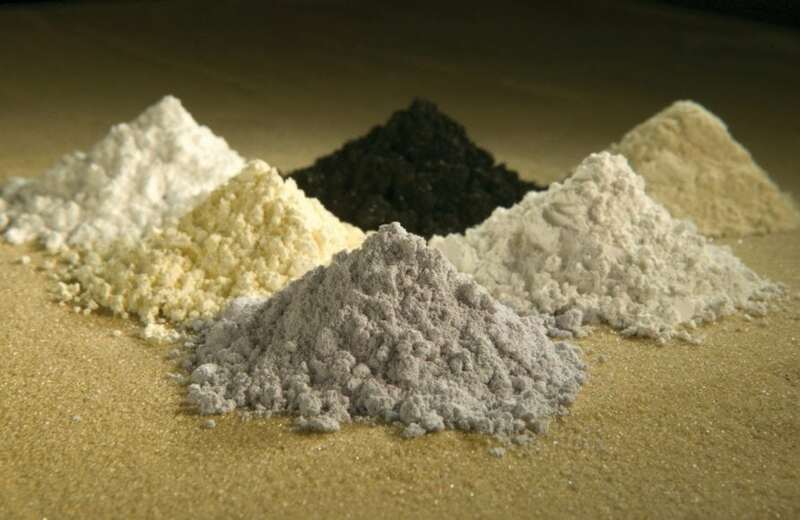 They were called rare earths in the late eighteenth century, and contrary to what you are thinking they are not so rare. In fact, in terms of their overall abundance, the REE are naturally present in the environment, in concentrations even more abundant than other metals so appreciated such as gold. They form a chemically uniform group and appearing usually together. But although they are relatively frequent in the earth crust, they appeared often in low concentrations. They occur more concentrated in specifically geological circumstances, and few locations with content in rock materials enriched enough in REE (usually carbonatite and alkaline rocks) to be exploitable have been found until today. At the beginning of the 90s, Chinese companies started to clearly dominate the REE world market; both (maybe), for the lower labor costs, less strict environmental regulations or directly by play of market, they export REE at low prices, hindering the competition in the production and even shutting down some exploitations. To give you an idea, in 2016, China covered the 83% of the total production, followed by far for Australia (11%). However, besides producer, China, is also the largest rare earth consumer, with a consumption of 98 kt in 2015 (79% of the total production). With the current consume pattern it could be expected that only China will use all world production in the next years. Therefore, nowadays, the main issue is that the boom of consumption doesn’t growth parallel with the current world production. It is estimated that world reserves are around 130 megatons of REE and, due to the expected upcoming consumption, new potential exploitation areas are being searched and opened around all the planet. With the increase in the production and consumption, there is also international concern about the health security of these elements, their environmental costs, and the impacts their use might have. REE anomalies have been detected in developed countries from the mid-1990s essential due to the use in medicine (e.g. Gd for magnetic resonance imaging). These anthropogenic inputs have since been widely reported in natural water systems, such as La, Gd, and Sm in the Rhine (Germany), Gd and Ce in the Alzette River (Luxembourg) or Ce in the Black Sea. The increase in REE production and consumption will lead to their release into the environment and several scientific researchers found that excessive exposure to REE could be detrimental to the environment and human health. However there is not a defined legislative framework for these elements, and until the data, only The Netherlands have published some maximum permissible levels (RIVM report 601501 011). To better understand the present and the future of REE exploitations the scientific work of our group is focused on understand from the beginning the potential hazard that REE mining exploitations can possess to nature. To quick sum up, a cycle of separation of the REE once ores have been found could follow this order: 1) ore exploitation by mining; 2) REE liberation from the ore by crushing, flotation and/or magnetism; 3) hydrometallurgy by using reagents (usually acid compounds) for leaching and precipitation of the REE; and finally, 4) a really tedious refinery work to separate from one another. In all steps, potential release of REE to environmental is a fact, in the two first steps because, after REE extraction, ore exploited and discards will be usually deposit again in the environment; whereas, in the last two steps wastewater leaks could occur due to a bad environmental management. Potential hazardous effects related to REEs have been reported, both for plants and animals and even for human beings. However, they are also used to favor plant growth and productivity, mainly in Chinese agriculture, although they are not essential elements for plants. Until the date, the role of REE in physiological mechanisms are still not well understood, and although, maybe, in small quantities, they could not be detrimental to organisms, or even show some positive effects, higher concentrations are been stated to be dangerous. Diverse works done in our group have revealed that they can pose potential toxic effects in plant roots and in aquatic organisms belong to the lower trophic chain, both for their own toxicity or by interaction with other nutrients. In a study done in river-sediments flowing over rock material enriched in REE we observed that although rocks contents up to 12,000 ppm of REE, the content in adjacent sediment-water bodies does not necessary match, which imply their potential transport. However the REE availability in sediments, even if it was reported really low, showed potential damage effects in living organisms. We also observed, simulating the rainfall over different rocks enriched in REE, that the content in the eluviations derived can decrease with weathering but, even so contrasting toxicity results for different aquatic organisms were observed. The trend towards a greater environmental input of REE indicates a pressing need to assess the potential hazard they pose. Future toxicity studies, to define ecological safety levels, done by governments, researchers and mining companies, should consider the influence of physicochemical properties of waters, sediments and soils to better understand the availability of the REE; understand the interactions among them and with other compounds present in nature; and assess the environmental impact of REE mining. With the final aim of estimating the maximum REE concentrations without impact for the environment and the humans. Nowadays the knowledge that we have about their potential environmental impact is just the tip of the iceberg because they had not posed any interest in last centuries. The imminent increase in their use should find us at the ready in order to not make the mistakes of the past. Governments, enterprises, and scientists must work together to take care of our environment and our own safety now and for the future. Numerical data obtained from U.S. Geological survey, report of 2016. More info about the project can be found here, and about the author here and here. This study, Assessment of baseline ecotoxicity of sediments from a prospective mining area enriched in light rare earth elements is a compilation of the researches done by Ana Romero-Freire, among others and published in the journal Science of The Total Environment. Ana is a postdoctoral researcher at the Spanish National Research Council, Instituto de Investigaciones Marinas, and the University of Lorraine.